The US EPA has now identified 13 states that need to make changes to their clean air plans, allowing them to issue permits that include GHG emissions. Flow meters such as FCI’s ST51 support accurate GHG monitoring by providing valuable clean air data necessary for industrial process control. In January 2011, industries that are large emitters of GHGs, and are planning to build new facilities or make major modifications to existing ones, will work with permitting authorities to identify and implement the most efficient control technologies to minimize GHG emissions. This includes the nation’s largest GHG emitters, such as power plants, refineries and cement production facilities. The second phase (July 2011 to June 2013) will apply to new construction projects with GHG emissions of 100,000 tons per year, or modifications that increase pollutants by 75,000 tons per year. The ST51 supports BACT (Best Available Control Technology) practices, which require technologies that achieve the maximum degree of emissions control that can be achieved by a particular facility and is based on a case-by-case decision that takes into account technical feasibility, cost and other energy, environmental and economic impacts. The “EPA considers a technology to be technically feasible if it has been demonstrated in practice" (refer to Page 35 of PSD and Title V permitting Guidance for Greenhouse Gases). The ST51 Flow Meter is ideal for the measurement and monitoring of industrial plant greenhouse gases. The ST51 features a no-moving parts design that’s non-clogging and operates over a wide flow range with low-flow sensitivity. It’s packaged in an explosion-proof transmitter, and the calibration is matched to the user’s actual gas composition and installation conditions. 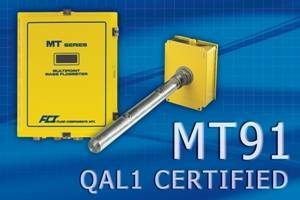 FCI designed the ST51 Flow Meter to measure and monitor GHG per the EPA’s requirements. It features a thermal mass, insertion-style flow element with flow accuracy to ±1% of reading over a broad flow range from 0.08 to 122 MPS, and repeatability of ±0.5 percent of reading. The flow element is available for use in line sizes from 51 to 610 mm. It operates over a wide turndown range of 100:1 and at temperatures from -18 to 121°C. It withstands pressures up to 34 bar (g). The ST51 Flow Meter’s robust thermal mass flow sensing element has no moving parts and no orifices to clog or foul to attain virtually maintenance-free service in wet, dirty biogas applications. The flow element is constructed with a 316L stainless steel body and Hastelloy C-22 thermowell sensors to resist corrosion. It includes built-in temperature compensation circuitry for accurate, repeatable measurement year-round as temperatures rise and fall seasonally. The ST51 flow meter is rich with outputs for user interfaces and information. Dual 4-20mA analog outputs are user assignable to flow rate and/or temperature, and there is a 0-1kHz pulse output for totalized flow. The transmitter’s digital communications include an RS-232C port, and with units that have the digital display option there is a wireless IR link for PDA use. A special GHG Reporting Web Page: fluidcomponents.com/Industrial/App/EPA-GHG-Mandate.asp is now live with FCI’s AVAL Gas Flow Meter Sizing Tool. AVAL is a simple online tool that assists process and plant engineers with proper flow meterselection.